Technological development has changed the way we do business forever. Today we seek the help of technology to run our day to day business needs smoother and turn more profit. Bookkeeping is one of the key places that have really made difference for business owners. With the help of a perfect bookkeeping tool, you can save money, save time, focus on your goals, work independent and moreover you can gain efficient performance. Adopting perfect software for your business is essential for every business’ to meet success. 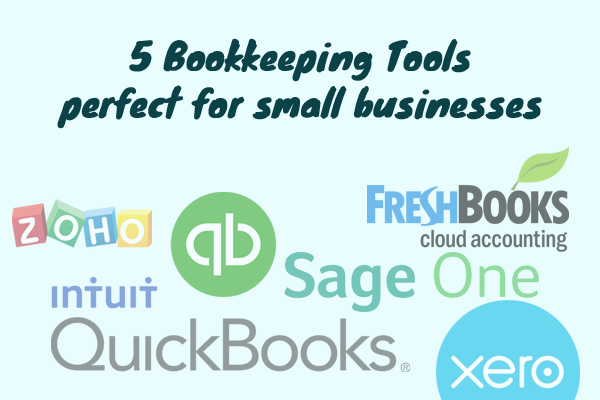 Here are some accounting tools that offer better security and does smart bookkeeping. This online version is popular desktop accounting software that allows you to work 24*7 efficiently. The software helps every business to make any place, work place. It can do all sort of accounting tasks including custom invoices and payroll calculations. It also offers secured access to your accountant in order to collaborate with the team anytime and anywhere. You can access this cloud-based accounting tool on desktop as well as in the mobile devices. It comes with all tools that are mandatory to manage finances, invoices and time & place tracker. You can import expenses from bank account or a credit card by taking digital records of receipts and pay fast by enabling credit card payments or any other payment gateways. Sage One is designed particularly for small business and has features like sending invoices, track pending, overdue invoices, sent invoices, email payment reminders, accounting reports and many more. This online accounting tool provides all tools required to have a better financial management. It has many features including fetching transaction, connecting bank accounts, tracking expenses and vendor balances and many more. It offers features that allow business to invite collaborators to integrate tools like Google Apps, Google Checkout, PayPal and many more. It is an ideal solution for small business to manage their bookkeeping tasks easily. It includes features from customer payments to expense managements, payroll, bank reconciliation, financial reporting and so on. This smart tool can also integrate with wide range of application add-ons. If you are one looking for a perfect bookkeeper, contact us!